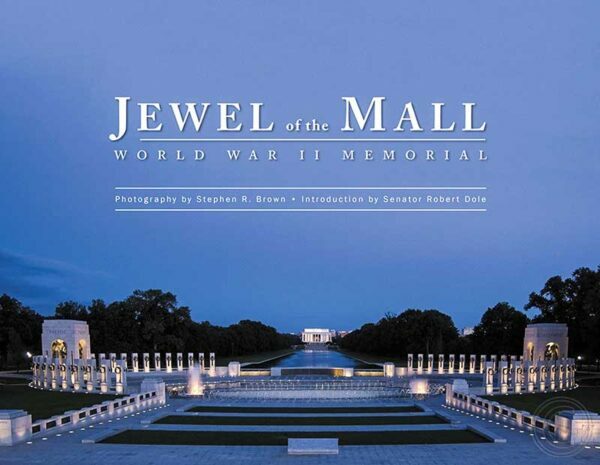 WWII Memorial: Jewel of the Mall is a 116 page full-color photographic book on the WWII Memorial with an introduction by Senator Robert Dole and photographs by renowned photographer Stephen R. Brown. The photographs are exclusive never-to-be duplicated images as Brown had access to the site and cranes as the World War II Memorial was built. He also photographed the creation of the 18-foot high 80,000-pound bronze sculptural eagles and related pieces, which adorn the World War II Memorial. The documentation of the “lost wax” process in itself is a unique peak into sculptural history. The book features panoramic scenes of the new face of the Mall; documentary of the creation and installation of the sculpture and marble ornamentation that is part of this new memorial. A section entitled “A Living Memorial” focuses on the day-to-day activities surrounding the World War II Memorial that make this memorial so vibrant, including Honor Flight’s WWII Veterans. Honor Flight has bought forty thousand books for their veterans so proud veterans of the Honor Flight experience are distributing it all over the country. Brown has sold over 100,000 WWII Memorial: Jewel of the Mall books through the Smithsonian and National Parks Service bookstores and to a number of Veteran and Civic Associations. You can order your copy using a credit card through our website or through our Amazon Author’s Page. For case quantities or questions, please feel free to email us at srb@srbphoto.com or call at 202-667-1965.